Last night was the college meeting for juniors at my school. I love talking about college... I think it's exciting to see where everyone wants to go and setting goals to try to get into your top choices. It's cool to pick a major and decide what you're truly passionate about. But, it's also a big decision and causes a lot of stress and can even be one of those downright dreaded conversations that you have to have with your parents. At my school, almost everyone applies to Madison. I had this idea that I was going to limit myself when it comes to applications by not applying anywhere I can't actually see myself going or that I want to go to. However, my parents are making me apply to Madison. For me, there's a pretty good chance I would get in, I'd say, and I have absolutely no desire to go there. It's a great school, filled with great people, but it's just not for me, does anyone get what I mean? I don't want to go there, I don't have anything against the school but I just don't see myself there... it's a huge school and I want to get out of Wisconsin. When it comes to situations like these, I hate dealing with reality. I don't want to do things my parent's way, I want to do things my way (typical, I know). I have to be patient and see what happens and trust that God will take me down whatever path I'm meant to go. It's not about the Madison thing... It's not about what college I end up at... It's about learning to live life day by day. Carpe diem, sieze the day! Make the most out of what you're given. If there's anything I've learned this year, you're not always guaranteed tomorrow, but you do need to be patient and live in the moment. 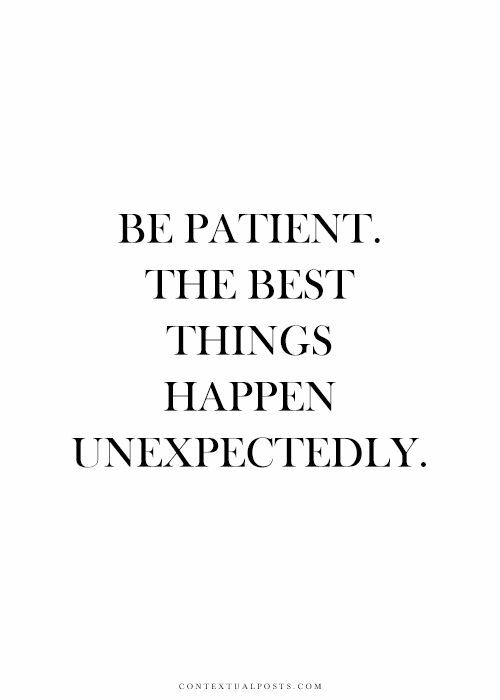 The best things happen unexpectedly. We all have those moments where we imagine a situation... you imagine your future life with the cutest boy you know, you imagine what that party is going to be like, you imagine yourself in a new city in a fabulous outfit. How often is our imagination reality? How often do these imaginations turn out to be right? For me, it's literally never. I'm not realistic, and I'm not patient. I need to learn to live in the moment... to put my phone down and just live in the moment. Patience is a virtue; it doesn't come to you overnight. I hope that I can just work hard enough to achieve it eventually. Love this post! So relatable! Choosing a college seems like the ultimate decision; but even if you pick what you think is your dream school, just remember that it's ok to transfer if you get there and realize it's not what you expected! As somebody who lives right outside Milwaukee, I think like 15% of my graduating class went to Madison. I however did not apply even though my parents wanted me to. I ended up having one of the most adult discussions with my parents in my life at that point with my parents. I told them I understood their reasoning, but I really needed to do things my way and that Madison was not a back up school for me! It's a difficult decision, but choosing the right college is about you! Good Luck! Great post! I was exactly the same way as you junior and senior year. I loved talking about college and what I wanted to do with the rest of my life, but the reality was I was just as stressed out (or maybe even more) than my friends and peers. You definitely shouldn't worry about these things to the point of being overly stressed and living in the moment is a great way to do that. Though, I would say don't give up on the dreams and imaginations you have. There is a reason you are imaging those things and keeping them in the back of your head can help make them come true. College decision time is definitely a time to be selfish and thing about what is right for you. Also, if you ever have college questions (schools or applications) please shoot me an email. It seems like you're having so many of the same thoughts I did and now that I'm an admissions ambassador at my school (and know so much more than I thought I did in HS) I would love to be able to help! Oh gosh, WOW I remember those days! I'm graduating college in May and absolutely HAVE to shamelessly plug Miami University in Oxford, Ohio. Seriously. Just take a look. Aside from being a great school, it's full of preppy dressed people, haha.